Hello, I’m the owner of Tea Ceremony Koto, just a1 minute walk from Kinkakuji temple. I welcome beginners and tourists. Since I can explain in ALL English, so about 80-90% of my customers are foreign tourists. Since you can do the private tea ceremony only for you here, you can enjoy more authentic tea ceremony, not like tourist’s attractions. If you come in over 6 adults group, it’ll be the private tea room! And I don’t accept over 8 people at once for the shared tea ceremony sessions. Since it’s such a small tea room, you make it exclusive tea ceremony if you come in the group over 6 people in the same price as usual . In addition, Japanese confectionary served in the tea ceremony will be the fresh sweets (higher quality). A customer from France repeated to visit for the private lesson. Sarah from France visited Japan to research Tea. 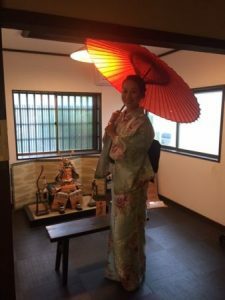 She had also visited China and Shizuoka Japan to research different kinds of tea, and at last, she visited KOTO to experience the authentic tea ceremony. First, she came in the shared tea ceremony, and the second, she took a private lesson. 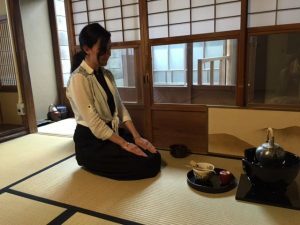 She said she’d like to learn some movements of the tea ceremony she can practice at home, so I taught her the way of tea “Ryaku bon” which we can do anywhere, outside or on the table as well as tatami room. She is going to practice at home and show me her way of tea some day she visits Kyoto. Some of my guests took Japanese lunch here before the private tea ceremony. The traditional Japanese meal was too traditional for some of them, but most people says it’s delicious. 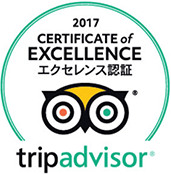 Especially, customers who have some allergy or vegetarians loved Japanese traditional meal with a lot of vegetables and soy. She on the photo tried wearing Kimono in addition to tea ceremony and lunch. It really looks nice on her. Holding the red Japanese umbrella, it seems like the gorgeous painting! If you take private lesson, it’s easier to reserve optional plans such as kimono, Origami and lunch. It is the tea ceremony only for you. Now, I’m thinking about making the new optional plan of Japanese flower arrangement which I have the license of master. If you are interested in learning the authentic Japanese culture, Tea Ceremony Koto is the nice place try, isn’t it?